One of my favorite vacation spots is Gatlinburg, TN. Yes I know it is can be a bit gaudy and touristy, but that's part of the charm. I just enjoy being able to being a tourist for a week and enjoying the great outdoors. And those who know me know I have been a teddy bear fan for years, so if you mix in bears you know I have died and gone to heaven. Sadly I never did find a teddy bear store. But I did bring home a black bear stuffed animal. At the end of our vacation we discovered The Three Bears Store. This place was packed with souvenirs. real bears and lots of fun! We could have spent hours here! The page looks curvy because Scott took the picture standing up between the easels instead of putting in on one side of the easel.The edges are all straight. I used Best Creations My Country Tis of Thee (Retired) for the entire Layout. I can't wait to see what you enjoy visiting n your country! Great layout Elizabeth! Love the patriotic colors! Love the patriotic colors! Fantastic LO! Really like the paper range you used Elizabeth - well done. I didn't know you were a fan of bears! Well gosh.. you would like where I live. Black bears, brown bears all over. 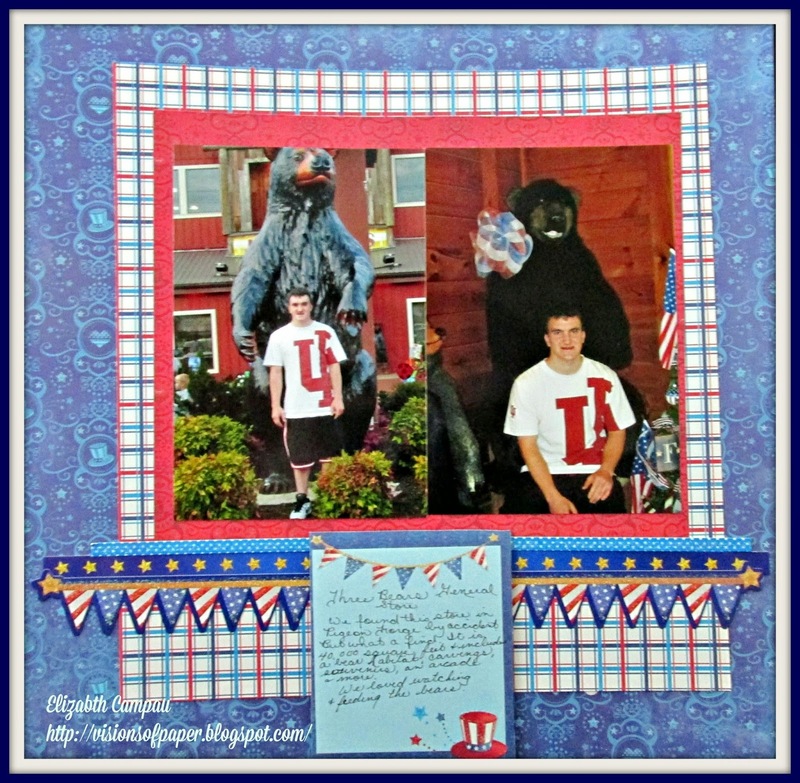 Fun layout, Love the patriotic colors.